A multitude of videos posted to sharing sites such as YouTube™ have helped to spread the "2012 doomsday" hoax and other forms of Cosmophobia. In fact, the founder of this website has said that YouTube videos were one of the reasons that this site was started. Various videos posted on YouTube purport to show evidence of one or more of the claims made by proponents. Many of them purport to show Planet X or Nibiru, or various phenomena which are claimed to be the handiwork of the Annunkai, the Reptilians, the Illuminati, NASA, HAARP, NSA, CIA, FEMA or other groups or agencies assumed to be acting in a nefarious role. In this page we will discuss some of the claims made in various videos, and demonstrate how the videos might be wrong. We will also provide links to some videos that take a skeptical viewpoint. There are many videos uploaded onto YouTube claiming to show a "second sun", a classic example that's often uploaded every few weeks is the video above. A number of questions need to be asked in order to get to bottom of these types of videos. Was the "second sun" visible to the naked eye? Was the "second sun" only visible through the view finder of the camera, or when watching the footage back after filming it? 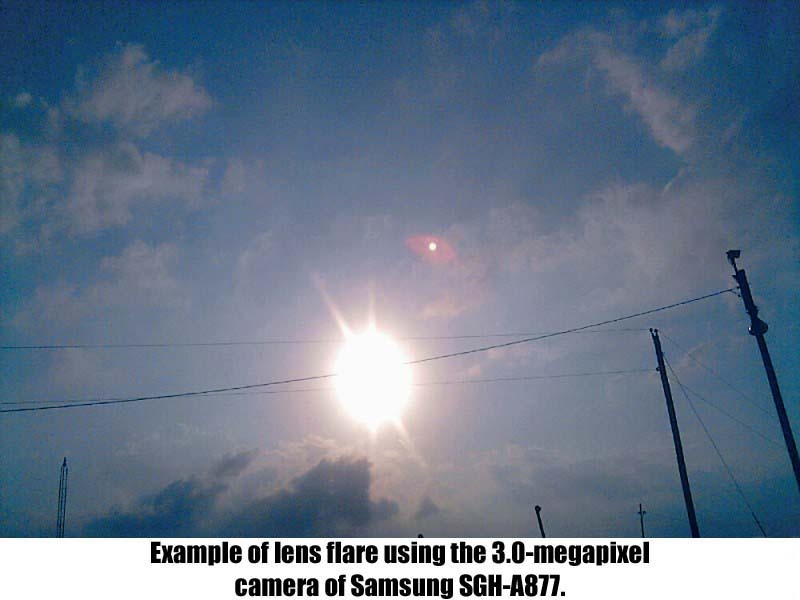 Cameras of all kinds, from the delicate instruments on satellites to the cameras in your mobile phones can suffer from image artifacts and lens flares, caused by a bright light source scattering and reflecting around the optics. 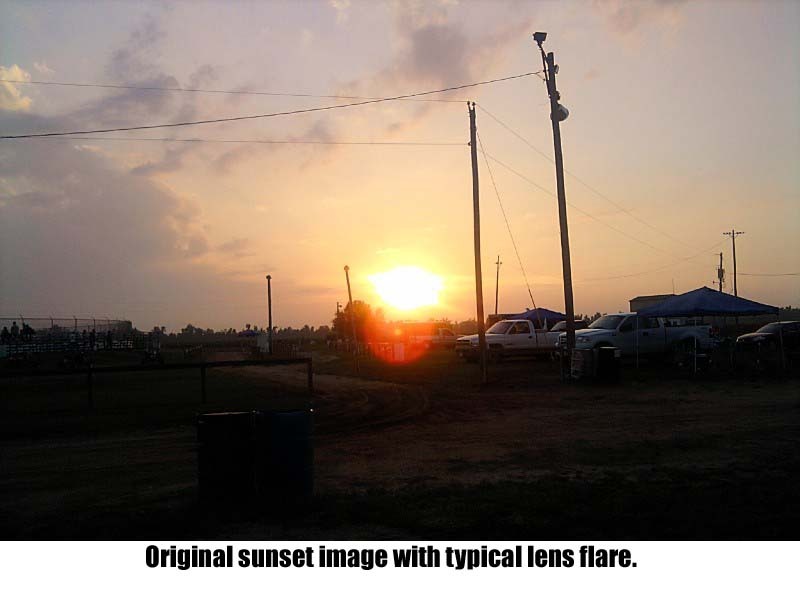 While there are measures you can take to reduce lens flare, there are also ways you can increase the chance of it happening, or the strength of the effect. Filming the sun through a car window, as this video may show, or even filming the sun through a CD jewel case can add strange visual effects. Many things can affect lenses - dirt, scratches, drops of water - and such imperfections on a camera lens may not be seen until photos or videos are watched back. You should always question whether the equipment used can cause the effect. Lens flares are well understood and can be created from any bright light source, and there aren't many brighter sources than the Sun. If it is not an image artifact or lens flare, can it be an optical effect caused by Earths atmosphere? Our atmosphere is capable of strange things, rainbows for example: light passes through a water drop, is refracted on its way through the drop, reflected off the back of the drop, and refracted once more as it leaves the drop. When it happens through many many drops at the same time, we can see a rainbow. There are similar effects caused by ice crystals, but instead of a rainbow, an image of the sun can appear to the left or right of the sun, often on both sides, and these are called Sun Dogs. Again, these atmospheric phenomena are well understood, such that we know the conditions likely to produce Sun Dogs, and exactly where they will appear in relation to the sun. Of course, to somebody who has never seen a sun dog in real life it can be quite an unusual sight, worthy of taking a photograph of, but it is only the appearance of a second sun, not an actual second sun. Like asking about the equipment used to take the images, we must ask about the weather conditions, and see if there are any known processes within our atmosphere that can cause the effect. Is it a deliberate hoax? Both video and still photographs can be made to show a 'second sun' by devices as simple as an extra pane of glass. Photographing the sun through a transparent layer such as glass or acrylic held at a slight angle to the camera will produce extra 'sun' reflections. Is it a still image, or a video? 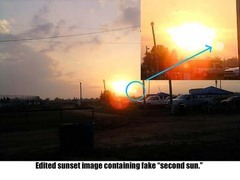 Both video and photos can be edited and enhanced to add the appearance of a "second sun", so could what you are looking at be a hoax from the start? Not everybody has access to video effects software, but image editing programs like Adobe® Photoshop® can be found on many home computers, and there are even websites allowing you to edit images if you don't have such software. A single frame is much easier to purposely fake than a moving image. It could also be a case where one interesting frame from a moving image was taken, and the rest ignored. A flashing light on the tip of an airplanes wing at night may be fairly obvious to identify in a video, but a still image of just one of those flashes can be harder for viewers to work out. 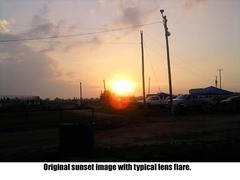 Appearances of 'Two Suns' can be attributed to known atmospheric phenomena, such as Sun Dogs, known image artifacts such as lens flares, or deliberate hoaxes using image editing software. A number of satellites have been sent up into space, primarily by NASA and ESA, so that the sun can constantly be studied in a number of different ways. Imagery from instruments on the Solar and Heliospheric Observatory (SOHO) can be viewed, searched through and downloaded freely by anybody, which has lead a number of people to grab the imagery and start hunting for what they perceive to be anomalies, rather than researching the satellite itself, how its instruments look at the sun, and what they are actually looking at. How do we know this is SOHO imagery? SOHO orbits the Earth-Sun L1 Lagrangian point, so it's between the Earth and the Sun. You can imagine the view we see of the Sun from Earth as the view SOHO sees, only it's always daytime for SOHO. While it has many instruments, they will all be looking straight at the Sun, and one of the most popular instruments for people to find strange things in is the Large Angle and Spectrometric Coronagraph Experiment (LASCO). In order to study the solar corona, LASCO needs to block out the Sun. Hiding the Sun behind an occulter1 creates a permanent eclipse of the sun for LASCO, and with no bright light source, dimmer sources of light from the solar corona, and even planets and comets become the brightest parts of the image. LASCO hasn't changed it's view for over a decade, so if you see these occulter features, with a date stamp in the bottom left corner, you know you're looking at SOHO imagery. What is that strange shape? LASCO, like many instruments both in space and on Earth, can suffer from image artifacts. In the video above, Phil Plait briefly introduces you to three planets in this view, one of which, Venus (just to the upper left of the Sun), shows two long arms either side. These are caused by too much light entering the CCD of the instrument, causing the light readings to spill over and spread out, and Phil has written an article on this very effect2. The same effect can happen for comets. Comets have tails, but in the LASCO imagery they can appear to have 'wings' due to this artifact. Many YouTube videos will show you an image of a comet seen by LASCO, followed by an ancient carving of a bird for example, as if the two are linked, but they only look similar - no ancient culture predicted image artifacts seen in satellite imagery. How do we know they are planets or comets? The orbits of the other planets in our Solar System are well known, and because we also know where SOHO is in space, we can make estimates of when planets will come into view. There are transit calendars available to look through to give you a rough guide of when something will appear, how bright it is, and which way it will move across the view. Comets are harder to predict, and many are first discovered within this imagery, but they all share a similiar appearance in both shape and movements through the view. There are groups worldwide who study and either confirm or retract comet sightings from SOHO imagery, so you will not have to wait long in order to know an object for sure. Imagery from SOHO is studied in great detail, and any strange shapes can be attributed to known image artifacts. Predictions can be made as to when an object such as a planet will enter the view of SOHO well in advance of its appearance, due to the known orbits of the planets and of SOHO itself. Another popular mission to study the Sun offers many different views of not only the Sun and the solar corona, but also of the space between the Sun and the Earth, all captured from the two satellites of the Solar Terrestrial Relations Observatory (STEREO). Like SOHO before it, imagery from either satellite, for any instrument for any time can be freely downloaded, and there is always something interesting to see. The video above shows just one of five views of the Sun and space, from one of the two satellites - you can imagine the confusion there can be with not only all of these views, but mixing it with imagery from SOHO too, so let's clear things up about the STEREO satellites - a lot of the problems that effect SOHO also affect STEREO, so much of the claims made using this imagery stem from similar mistakes. It helps a lot if we know where in space these two satellites are. Handily, there are simple maps showing you where each satellite is. STEREO-A is the Ahead satellite, orbiting the sun ahead of Earth. STEREO-B is the Behind satellite, orbiting behind the Earth. As we circle the Sun, so do these satellites, A is always ahead of us (to our right, if you will) and B is always behind (to the left). Each satellite is equipped with the same instruments, looking at the same things but from different sides. Some instruments, such as the Outer Coronagraph (COR2) instrument you see in the video, point straight towards the Sun. Others, including the Heliospheric Imager (HI1) point towards the space between the Sun and the Earth. An explanation of the fields of view for each instrument can be found here. How do we know this is STEREO imagery? Every image that each satellite records is stamped with key information. At the top of every image should be the satellite name and instrument name. In the video above, it reads 'STEREO Ahead COR2'. With this information, we know exactly where we are in space, in relation to the Earth and the Sun, and we know exactly where the instrument is looking. Just like the LASCO instrument on SOHO, this particular instrument, COR2, studies the Solar Corona, and it does so by blocking out the Sun so that much fainter sources of light become the brightest parts of the image. Just like SOHO, planets will wander into this view from time to time, and because we know about both where the satellite is and what it's field of view is, as well as knowing where the planets are at any given time, we can work out which planet is in view of the instrument. Luckily, there is an easy way to check, and that is the planet finder page, which shows the latest imagery and highlights any planets that are in the views of each instrument. Strange shapes like the 'butterfly' shaped Venus in the video above are again explained by bright sources of light diffracting off the occulter, more information about this and other images artifacts that affect the STEREO instruments can be found here. Besides the COR2 instruments, many claims are made about the Heliospheric Imager, or HI1. This instrument, shown in the video below, doesn't look straight at the Sun, but just off to the side, the space between the Sun and the Earth. Once more, planets will appear in this imagery, as well as many strange looking reflections that you can see at the end of this video. This classic case is explained in detail on the STEREO website, but at it's simplest, as Venus leaves the field of view for this instrument ('STEREO Behind HI1', as shown in the name stamp), light is reflected off the camera to create a ring reflection, and once Venus has left the view, a final flash of light diffracts of the instruments baffle edges. Many people claim these flashes to be comets, or even Venus itself, but they are all known artifacts, and we expect them to occur in many cases as planets pass through various fields of view. STEREO imagery from any instrument can be troubled by known and understood image artifacts, and while harder to work out than SOHO, known orbits for planets and the satellites can allow for predictions of when planets will appear and disappear from view. There are many free, easy to use pieces of software that bring the best sky surveys straight to you, allowing you to view any star in any constellation, and imaged by a wide range of instruments and in different wavelengths, but they all come with their own problems, and despite their apparent usefulness, they all fall short of viewing the sky itself. What is that black box? Many videos, like the one above, show these pieces of software to contain black boxes over certain places in the sky. The claim is often that space has been censored, that the boxes cover something we are not meant to see, but there are a few problems with this line of thought. Google Sky, for example, is essentially a front end to the sky surveys whose imagery it uses, including the Digitized Sky Survey, the Sloan Digital Sky Survey, and selected imagery from the likes of the Hubble Space Telescope. In stitching and layering all of those image sets together, some processing errors will creep in and images simply won't be displayed. But because Google Sky cannot show something, it doesn't mean it is being censored or has been deleted from the records - we can get behind the black boxes. How can we avoid the black box? If Google Sky cannot display an image, and we know which imagery Google uses, we can go straight to the source and search the catalogs directly, as you can see in this video. Different programs contain different sets of imagery, WikiSky for example allows us to see imagery from IRAS, the Infrared Astronomical Satellite, one of the original sources for the Planet X claims back in the 1980s. While searching through the following sites appears a lot more complex than looking through Google, these links will go straight to the data that is being used by these sky programs, and will also have a lot more information about that point in space, depending on how much we want to find out. At it's simplest, you will only need to know the coordinates of the region in space you want to look at, and, handily, this information is usually always given in a video that claims something is being hidden. NASA SkyView Virtual Observatory is the easiest to use, enter your coordinates, select a survey and away you go. The SDSS DR7 Finding Chart Tool contains the latest imagery from the SDSS, but be aware that only 25-30% of the sky has been surveyed here, so chances are you'll also find a blank image, but the reason for it is known - the survey has not covered this region of space. The Hubble Space Telescope has done a lot of work, but has also not surveyed all of the sky, so again, chances are you might not find anything here. The Infrared Science Archive contains many surveys, including those of IRAS and 2MASS, as well as a Finder Chart tool that allows you to quickly compare images. Does that photo come from behind the black box? In the case of the video above, the image that opens the video is described as a leaked photo from the South Pole Telescope (SPT), and links it to the black box in Google Sky. We can of course check from the sources above what is actually behind the black boxes, should any photographs be shown claiming to be the original content, but in this case we can pursue another route. A little research reveals that the SPT does not take photographs. It doesn't see the sky in visible light, rather it detects heat. It studies the Cosmic Microwave Background Radiation and doesn't hunt for planets. But the image is known however - it's known to be a hoax. It's from a series of fake images that managed to fool the likes of Marshall Masters, who still claims it to be genuine to this day. The more pieces of 'evidence' used in the video, the more approaches there are to finding out the truth. It requires us to do a bit more research, but we'll learn more at the end of it. Should these programs be used as evidence of Planet X / Nibiru / etc ? In a word, no. These programs are easy to use and fun to explore, but at the end of the day they are only collections of photographs. They aren't always up to date, they may contains errors. WikiSky even allows users to upload their own imagery and label their own stars, so keep an open mind. If you find something strange within them, you should always check elsewhere before coming to a conclusion. Programs like Google Sky and WikiSky are useful to get people interested in astronomy, but it should not be the basis of research, or used as evidence of a claim. If you see something strange, often in the form of image processing errors such as black boxes, check the source of the imagery first. There are more logical explanations than ‘it is being blocked from the public’. There are many thousands of videos on YouTube promoting nonsense in the 2012 arena: we have discussed the common themes above. David Morrison has his own page here, but since this page is about YouTube, we thought it would be appropriate to link to his video again here. YouTube user 3WMElliott is also a member of this site3, and had substantial input into this page, but neglected to link to his own series of videos on this topic. We correct that oversight here. The following resources for checking out the claims made in the various YouTube videos were posted in the description of one of 3WMElliott's videos, 05h - STERE-Oh look, it's Venus. Again. 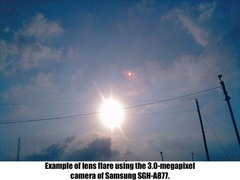 In some cases, especially with imagery from STEREO and SOHO, it can take a matter of minutes to disprove the claims of a Nibiru proponent, and show people what they're really looking at. Minutes. Literally. You and I could sit down, check a few web pages, double check them with some other software if we needed to, and job done, no Nibiru today, just plain old Venus. So why can't Nibiru believers do these important few minutes of research? Why can't they check their own claims before unleashing them into the Internet wilderness? That's all I ask, check your own claims so somebody like me doesn't have to spending 5 minutes debunking them. And to do so, here is a whole bucketload of links to help you out, and more may be added as time goes by. Check these links first, understand a bit about the satellites before you makes stabs in the dark as to what could be in the imagery, and know that there is always someone who will know more than you whom you can contact and ask questions to. I've done it, why can't you? 2. The article concerns the last Planet X doomsday, 2003. It's 2010 and people are still making the same mistakes about SOHO.